Contact us for our next available course. "Next to my wife, the Hooked On Classics Appraisal Workshop is one of the best decisions I�ve made! I have already earned over $25,000 doing what I love; working with classic cars and their owners." 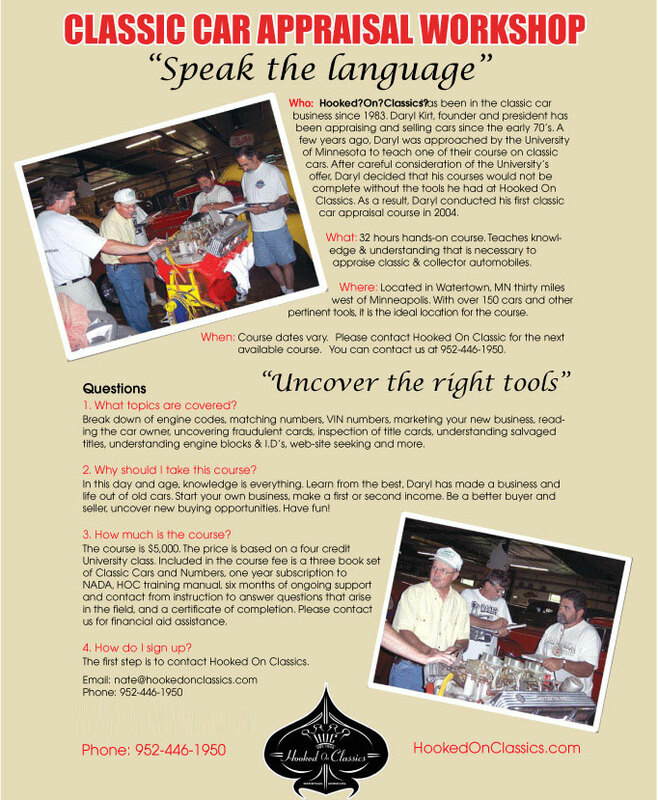 "The aspect I liked the most about the Classic Car Appraisal Workshop was the teacher! Daryl was very informative and conducted class in a pleasant and relaxed atmosphere." "Hooked On Classics Workshop added to my existing knowledge of classic cars. I now have an endorsement from the "expert", Daryl Kirt. The best part about the course was that Hooked On Classics Appraisals is available to me after the course ended. I essentially have a consultant I can contact with questions about the market and trends. "